NOTE: This Mini-Series program is currently available for Pharmacy Continuing Education (ACPE) credit, CME credit (Physicians), Physical Therapy, Occupational Therapy, and Speech-Language-Hearing. Nursing may be able to utilize ACPE or CME credit toward their licensure. It is the policy and practice of the Texas Tech Health Sciences Center Office of Continuing Medical Education to resolve all potential conflicts of interest prior to presentation. All members of the Planning Committee for this activity have signed a disclosure stating no relevant financial relationships with any commercial interest that could create a conflict of interest. Contributing individuals: Craig D. Cox, PharmD, FCCP, BCPS; Renee Bogschutz, Ph.D., CCC-SLP; Brian Irons, PharmD; Lamicha Hogan, RN, MSN, FNP-C ; Dawndra Meers-Sechrist, Ph.D. and Mimi Zumwalt, MD. 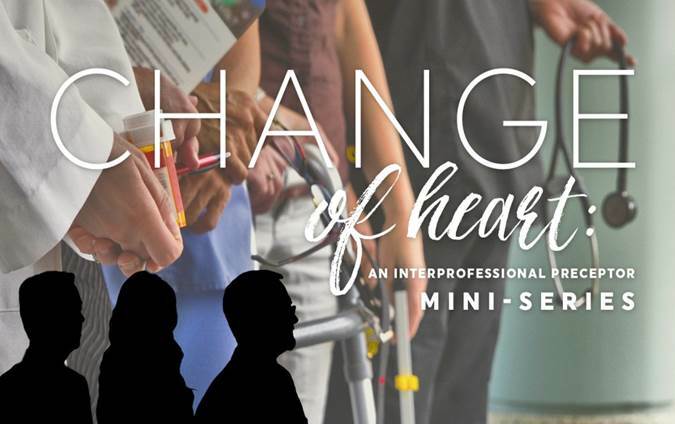 Change of Heart: An Interprofessional Mini-Series was directed by Dr. Craig Cox and Dr. Renee Bogschutz. Dr.'s Cox and Bogschutz are employed by Texas Tech University Health Sciences Center and receive a salary. They have no other financial or nonfinancial relationships to disclose. This program will focus on the interprofessional education mini-series as developed through Texas Tech University Health Sciences Center and will not include information on any other similar or related products. This is a 12 episode, knowledge-based, video series developed to educate both preceptors and students regarding their participation in experiential rotations in an Interprofessional setting. Each individual video episode is 5-10 minutes in length and builds upon the next. The series follows multiple health professional preceptors including nurses, pharmacists, physicians, speech-language-pathologists, occupational therapists, and physical therapists as they precept their students in both a hospital and extended care setting. Through a combination of inappropriate and quality Interprofessional interactions, attendees will learn key principles regarding orientation, feedback, teamwork, and dealing with difficult preceptors or students. At moments throughout each episode, two preceptor and two student experts provide humorous interactions and share insight on how they would deal with each learning situation. Each individual episode ends with two important preceptor and two student pearls. Introduce general concepts of interprofessional precepting on experiential rotations involving physicians, nurses, pharmacists, physical therapists, speech language-pathologists, and occupational therapists. Discuss communication, teamwork, roles and responsibilities, and values/ethics through challenging scenarios that occur in both an inpatient and outpatient settings. Course Requirements: This online course is available for 3 hours of Continuing Education credit. In order to receive credit, all individuals must watch all (12) individual video episodes and complete the short assessment following each episode. After all videos have been viewed and assessments complete, a final course evaluation will be made available. Following completion of the course evaluation, continuing education credit will be granted. A certificate of participation will be made available to participants immediately upon completion. For pharmacists, your credit will be immediately sent to CPE Monitor to be logged in your online account (be sure that all of your information is correct when you register). For physicians, you will need to request an official transcript as certificates will not be provided (see instructions below). For all other professions, you will be sent a formal certificate with your profession requirements for continuing education within 30 days of completing the program. Resume a Course: To resume a course, login to your account at the top right side of the page. Next, go to "Pending Programs/CE" in the top gray toolbar. Select the "Distance" tab and then select "Preceptor Mini-Series 5: A Change of Heart." (3) Physical Therapy - A formal CE certificate will be emailed to you (the email provided during registration), NO LATER than one week following completion of the activity. This only applies to Texas preceptors. (4) Occupational Therapy - A formal CE certificate will be emailed to you (the email provided during registration), NO LATER than one week following completion of the activity. Texas Tech University Health Sciences Center Designates this enduring material for a maximum of 3 AMA PRA Category 1 Credit(s)TM Physicians should claim only the credit commensurate with the extend of their participation in the activity. This activity has been approved by the Texas Board of Physical Therapy Examiners for (3) CCUs for PT's and PTAs. This activity is eligible for a maximum of 3 hours/CEU's. Occupational therapy practitioners should claim only those hours actually spent participating in the educational program. Many Boards of Nursing across the country allow nurses to count AMA PRA Category 1 Credit(s)TM toward their licensure. Participants should be aware of their state requirements and whether this applies to their area. Documentation of participation in this 3 hour activity can be obtained via the CME transcript. See above, how to receive a transcript. Any participant may submit a complaint regarding the Mini-Series program to craig.cox@ttuhsc.edu . Any requests for special accommodations should also contact craig.cox@ttuhsc.edu for assistance. Thank you for your interest in the program. What are things the physician preceptor did well? What could she have done better during the orientation with her medical student? List three qualities of students that could create a challenging learning environment for a preceptor. Do not take on a dictator leadership style as a preceptor. It is important to engage and get to know your learner. Identify elements of a quality orientation that should be provided to students at the start of an experiential rotation. Episode 2: "It’s All a Blur"
1. Describe the positive interactions between different health care professionals you viewed in this scenario? 2. What do the terms “general” and “direct” supervision mean to you? What type of patient care activities do you think can be performed by a student with “general” supervision and ones that require “direct” supervision. 3. List one thing you learned during the program that you intend on incorporating into your rotation experiences. 1. Be aware of your students attention to what is going on when working in teams. If a student becomes disengaged the learning is diminished and the potential for mistakes increases. 2. Demonstrate how to work with other health care professionals on a team through effective role modeling. Recognize the importance of demonstrating respect to other health care professionals. Discuss the necessity of proper supervision and communication with students. 1. What feedback would you provide the nurse preceptor in this episode regarding her communicating skills with her student? 2. What impact could the conflict between health care professionals at the bedside of the patient have on their care? Have you ever experienced a similar situation? If so, please describe and how you dealt with it. 1. Model skills to your students on how to effectively communicate with patients and other healthcare team members. 2. Determine level of delegation of patient care that is safe and appropriate. Recognize, assess, and address issues in professionalism among healthcare team members. Episode 4: "Calm After the Storm"
1. Briefly describe a mistake you have made in your professional career? Did you take accountability for your actions? If so, what was the most difficult component of the situation? 2. Describe a situation when you had a conflict with another health care professional. How did you resolve that difficult situation? 1. It is important to demonstrate to students how to take accountability for your actions. Not only for your successes but also your mistakes. 2. Learning to resolve conflict without blaming others for mistakes can be vital to a student’s education. Hopefully catastrophic events do not occur but if they do, they can be an invaluable tool in teaching conflict resolution. 1. Is there an activity and/or technique you use with your students to engage them with other health care professionals? 2. Do you regularly ask other health care professionals for feedback if they help supervise your students/residents when you are not around? If so, how do they provide you with their feedback? If no, is this something you would consider doing? 3. List one thing you leaned during the program that you intend on incorporating into your rotation experiences. 1. Prepare student learners for interprofessional team conferences. Provide a ‘space at the table’ for learners from all professions to present in a safe team-based environment. 2. Encourage students to work with individuals from other professions. When appropriate, utilize other health care professionals to assess your student’s performance. Show students how to engage other healthcare professionals to expand their knowledge to enhance their delivery of patient care. Utilize other healthcare team members to assist you in identifying a student’s ability to participate in interprofessional activities. 1. How would you have handled the student in this episode when she started using the “big words” with the patient? 2. How do you know when a student needs your “direct” supervision (side by side) vs. “general” supervision (student working more independently)? What student characteristics do you look for to help you determine this? 1. Include students in all aspects of patient care including interprofessional team collaboration. 2. Modify levels of supervision commiserate with student ability. Begin with direct supervisor until student demonstrates ability for greater independence. Identify appropriate communication strategies to use with your students when providing patient care. Episode 7: "Words of Encouragement"
1. What did the preceptor do well in giving feedback to the student in this episode? What are things the preceptor could improve on? 2. Describe your most challenging feedback session? What made it challenging? How did you overcome it? If you have never had a student on rotation, what is your biggest concern in regards to providing feedback? 1. Sometimes as a preceptor, you must be willing to put your student in the spotlight. However, don’t abandon them to the pressure. Allow them to struggle but be there to provide feedback as necessary. 2. Be open to the possibility your student will identify something you overlooked. When this happens, provide encouragement to your them rather than getting defensive. This can help to build their confidence. Identify ways in which feedback can be provided to students during interactions with patients or colleagues to avoid diminishing others’ trust in the student. Discuss the importance of providing students immediate feedback of their performance. Episode 8: "Pushing The Limits"
1. Have you ever used a learning contract, or something similar, with your students during your rotations? If yes, what benefits has it had? If you never have used one, what benefits can you see to using a learning contract? Use clear, written learning objectives in the form of a learning contract with a student who is not meeting performance expectations. Communicate regularly with your student and when necessary with their professional academic program administrators. Recognize the importance of using clear, written learning objectives in the form of a learning contract with a student who is not meeting performance expectations. Identify a process for communicating with a struggling student and his/her academic program. Episode 9: "It's Not Easy"
1. Provide an example of a situation when you have “modeled” skills for your students and/or residents. If you have not yet had students, what does the process of “modeling” skills mean to you? 2. In this episode, students were faced with a very difficult family situation that appeared to make some of them uncomfortable. Describe a similar situation you have faced during your experiences as a preceptor and how you handled it with your students. If you have not yet been a preceptor, how would you have approached the situation in this episode with your students? 1. There are moments on a rotation where preceptors need to model behaviors for their students. This is especially critical in difficult situations or when a student is experiencing something for the first time. 2. When students experience uncomfortable situations it is important preceptors take time to debrief with them to assess how they feel and determine what they learned. Illustrate appropriate preceptor modeling skills to utilize with students when faced with challenging learning situations. Recognize the significance of debriefing with your students following each learning experience. 1. In this episode, the nursing student was seeking out some independence in completing a rotation activity. What do you feel the preceptor did well in responding to the student’s request? What could she have done better? 2. Do you make student self-assessment a regular part of your student feedback process? If yes, what benefits do you see in doing this? If no, than why have you not routinely done this and will you know consider? 1. As a rotation progress, encourage students to seek increased independence in the clinical setting. 2. Provide timely, constructive feedback to guide students’ clinical reasoning. Discuss process for encouraging students to seek increased independence in the clinical setting. 1. In this episode you see multiple health professionals and their students discussing a difficult situation involving a patient who had passed away, most likely from one or more medical errors. What do you think the preceptors did well in this episode to comfort their students? What could they have done better? 2. Have you made a mistake as a health care professional? If so, how did you handle that situation? Do you ever use this as an example for your students to learn from – if not, is this something you might consider doing? 3. List one thing that you learned during this program that you intend on incorporating into your rotation experiences. 1. Implement effective guidance and management of ethical dilemmas. Encourage respectful and clear communication between inter-professional healthcare team. 2. Teach students the importance of being accountable for their actions regardless of the positive or negative impact they have had on the patient treatments and outcomes. Explain process for effectively guiding and managing ethical dilemmas with students in an interprofessional patient care situation. Recognize the importance of taking accountability for your actions and the impact it can have on interprofessional team dynamics. 1. What has been your most rewarding experience as a preceptor? What specifically made that experience so rewarding? If you have never served as a preceptor for a student, what do perceive are the greatest benefits? 2. Do you spend time reflecting on your performance as a preceptor during each rotation experience? If yes, what are a couple of things that have changes as a result of your reflection? If no, what potential benefits do you seen in performing self reflection? 3. List one thing that you learned that you plan on incorporating into your rotation experiences. 1. Your success as a preceptor is sometimes “invisible”. You may have to accept that you may never be told face-to-face that you have done a great job, but you have to trust that your experience has positively impacted your students. 2. Sometimes the reward is not immediate, but months or years down the road when a learner acknowledges your impact. This is the final evaluation for Mini-Series 5: A Change of Heart. Once you have successfully completed this evaluation you will receive 3 hours of continuing education credit that will be automatically sent to your CPE Monitor Account.